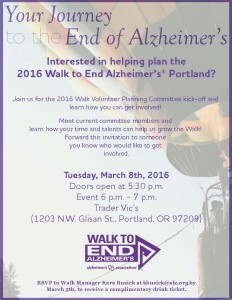 Join us for the 2016 Walk Volunteer Planning Committee kick-off and learn how you can get involved! Meet current committee members and learn how your time and talents can help us grow the Walk and move us closer toward a world without Alzheimer’s! Forward this invitation to someone you know who would like to get involved. We have many open positions on various subcommittee’s. We look forward to meeting and greeting with you and bringing you on board to a great cause! RSVP to Walk Manager by March 5th for complimentary drink ticket.